We’re back to showcasing some of the amazing .xyz websites in the wild, and we’re delivering a special installment this week. We’re kicking off the fall with #WebsiteWednesday: International Edition. One of the greatest things about the internet is how it connects people without hopping on a plane. Our first stop? Japan. Brought to you by the mobile gaming giant, DeNA, is www.rumor.xyz. DeNA runs the largest mobile social networking platform with over 30 million users – and they’re introducing their freshest app (only 3 days old) with a .xyz domain name. It reminds us a bit of Whisper, but it throws in the “social” aspect of social media that we all love. Ever feel like anonymously sharing a little secret or asking your friends something to see their reaction? Rumor lets you do just that. 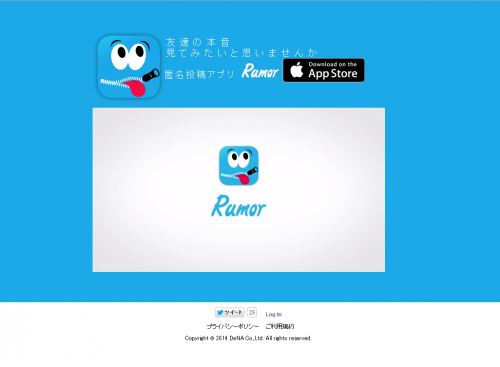 Check-out their promotional video for a glimpse into the newest app in Japan! Advertigo is a modern branding and advertising agency that specializes in the building materials market. Their expertise in architecture and construction shines through in their sleek, newly designed website. Even though they’re based in Romania, their reach is massive – their audience includes English, German, Romanian, Hungarian, Bulgarian, Russian, AND Chinese speakers. They’re also part of the E3 International Agency Network, which brings together the brightest in branding and communication from over 30 countries. We have a lot in store for the fall, so stay tuned and drop us a line through Facebook, Twitter, and Instagram. And last but not least, we’d like to give a special shout out to all of our Facebook followers. Each and every one of you helped us leap over the 3,000 follower milestone! Here’s to many more to come.